At any given moment, as many as 10 million wild jets of solar material burst from the sun’s surface. They erupt as fast as 60 miles per second, and can reach lengths of 6,000 miles before collapsing. These are spicules, and despite their grass-like abundance, scientists didn’t understand how they form. Now, for the first time, a computer simulation — so detailed it took a full year to run — shows how spicules form, helping scientists understand how spicules can break free of the sun’s surface and surge upward so quickly. This work relied upon high-cadence observations from NASA’s Interface Region Imaging Spectrograph, or IRIS, and the Swedish 1-meter Solar Telescope in La Palma, in the Canary Islands. Together, the spacecraft and telescope peer into the lower layers of the sun’s atmosphere, known as the interface region, where spicules form. The results of this NASA-funded study were published in Science on June 22, 2017 — a special time of the year for the IRIS mission, which celebrates its fourth anniversary in space on June 26. Observing spicules has been a thorny problem for scientists who want to understand how solar material and energy move through and away from the sun. Spicules are transient, forming and collapsing over the course of just five to 10 minutes. These tenuous structures are also difficult to study from Earth, where the atmosphere often blurs our telescopes’ vision. A team of scientists has been working on this particular model for nearly a decade, trying again and again to create a version that would create spicules. Earlier versions of the model treated the interface region, the lower solar atmosphere, as a hot gas of electrically charged particles — or more technically, a fully ionized plasma. But the scientists knew something was missing because they never saw spicules in the simulations. The key, the scientists realized, was neutral particles. They were inspired by Earth’s own ionosphere, a region of the upper atmosphere where interactions between neutral and charged particles are responsible for many dynamic processes. The research team knew that in cooler regions of the sun, such as the interface region, not all gas particles are electrically charged. Some particles are neutral, and neutral particles aren’t subject to magnetic fields like charged particles are. Scientists had based previous models on a fully ionized plasma in order to simplify the problem. Indeed, including the necessary neutral particles was very computationally expensive, and the final model took roughly a year to run on the Pleiades supercomputer located at NASA’s Ames Research Center in Silicon Valley, and which supports hundreds of science and engineering projects for NASA missions. The model began with a basic understanding of how plasma moves in the sun’s atmosphere. 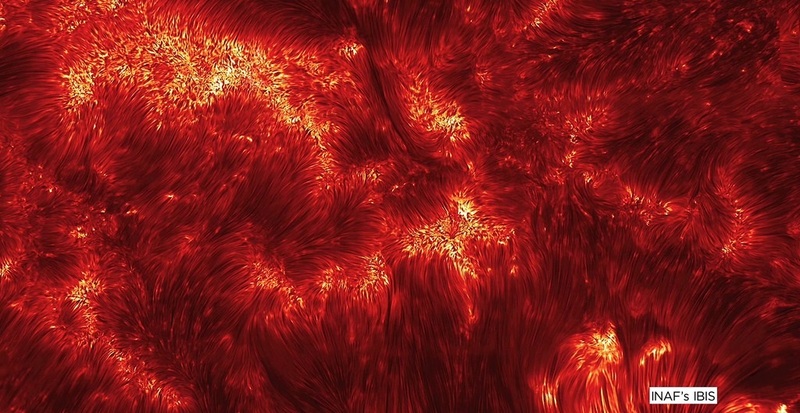 Constant convection, or boiling, of material throughout the sun generates islands of tangled magnetic fields. When boiling carries them up to the surface and farther into the sun’s lower atmosphere, magnetic field lines rapidly snap back into place to resolve the tension, expelling plasma and energy. Out of this violence, a spicule is born. But explaining how these complex magnetic knots rise and snap was the tricky part. Neutral particles provide the buoyancy the gnarled knots of magnetic energy need to rise through the sun’s boiling plasma and reach the chromosphere. There, they snap into spicules, releasing both plasma and energy. Friction between ions and neutral particles heats the plasma even more, both in and around the spicules. With the new model, the simulations at last matched observations from IRIS and the Swedish Solar Telescope; spicules occurred naturally and frequently. The 10 years of work that went into developing this numerical model earned scientists Mats Carlsson and Viggo H. Hansteen, both authors of the study from the University of Oslo in Norway, the 2017 Arctowski Medal from the National Academy of Sciences. Martínez-Sykora led the expansion of the model to include the effects of neutral particles. The scientists’ updated model revealed something else about how energy moves in the solar atmosphere. It turns out this whip-like process also naturally generates Alfvén waves, a strong kind of magnetic wave scientists suspect is key to heating the sun’s atmosphere and propelling the solar wind, which constantly bathes our solar system and planet with charged particles from the sun. The simulations indicate spicules could play a big role in energizing the sun’s atmosphere, by constantly forcing plasma out and generating so many Alfvén waves across the sun’s entire surface.